SCOTLAND’S most glamorous night in the racing calendar - Champagne GH Mumm Ladies Night at Ayr will be held on Saturday 8 August, and this year’s event promises to be the best ever. 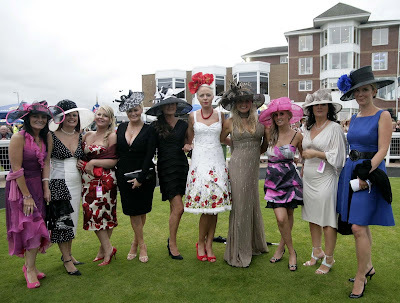 Around 8,000 people will make Ladies Night 2009 at Ayr Racecourse a very special glam night out. Glamour abounds as ladies young and old don their glad rags for a night of fun and the chance of winning big by being awarded a bronze coin and a passport to Ladies Day Final on Friday 18 September. Prizes that day are simply superb - this year’s top prize is a Vauxhall Tigra Convertible courtesy of Kerr & Smith and Iveco Trucks and second and third prizes are a Norwegian cruise courtesy of Fred Olsen and a piece of jewellery from designer Alex Cairncross. Judges will mingle with the crowd on Ladies Night, and choose a number of ladies they consider to be the best dressed on the night. They will be presented with a bronze coin that guarantees them a place in Ladies Day Final when they will draw the name of a horse running in the big race that day - the William Hill (Ayr) Gold Cup. The lady who picks the horse that wins the race drives off in the fabulous Kerr & Smith Vauxhall Tigra, with the runners up bagging the other fabulous prizes. But don’t worry if you don't come away from Ladies Night with a coin - you will still have a fabulous night out in stylish surroundings. Relax with a glass of bubbly in the sumptuous surroundings of the Champagne Lawns adjacent to the paddock. Or strut your stuff in the prestigious Princess Royal Suite which boasts two bars and a panoramic view of the racecourse. And the fun doesn’t end with the last race - there is superb entertainment with leading show band Waterfront performing in the Princess Royal Suite and renowned blues band Counselled Out appearing in the Ayrshire Suite. Both bands will be playing late into the night, and there will be plenty of room to dance. First race is at 5.50pm and gates open at 3.50pm. There are seven races on the card with the first - the Victor Chandler Apprentice Handicap over 6 furlongs with £6,000 in prize money. Feature race on the night is the Champagne GH Mumm Cuvee R. Lalou EBF Maiden Stakes for two year olds over seven furlongs which should attract some promising juveniles. The evening also features one of the longest races of the flat season at Ayr - the 1 mile 7 furlongs Champagne GH Mumm Cordon Rouge Handicap. For more information on racing at Ayr go online at www.ayr-racecourse.co.uk or call 0870-8505666. There are currently 554 Ayrshire business stories permanently archived on this site. To locate those of most interest to you, please use the site search facility in the top left hand corner of this page. Type your search term in the white box, then click “SEARCH BLOG”.